View from Saint-Charles station to the Basilica of Notre-Dame de la Garde, Marseille. The site of the first Blessed Sacrament Congregation chapel and community house at Marseille is located in a narrow street in an older section of the city that is now dominated by three and four-storey apartment buildings. 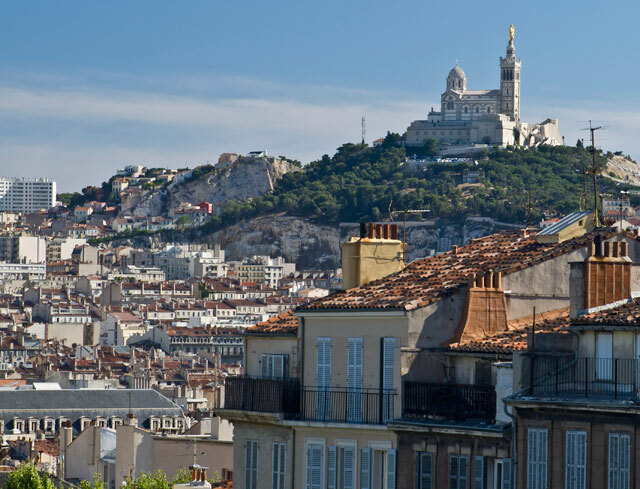 In the history of the Blessed Sacrament Congregation, Marseille is significant as the Congregation’s first religious community to be established outside Paris. Marseille represented a coming of age for the Congregation and the beginning of its expansion to other places in France and later throughout the world. The character or ‘model’ of religious life that was established in the early years at Marseille also had a major influence on the later development of the Congregation’s mission and culture. Eymard’s original companion at Villa Chateaubriand, Fr Raymond de Cuers, was the driving force behind Marseilles, before and after its establishment in 1859. For some years prior to the opening, De Cuers had been laying the groundwork for the future foundation. Eymard was eventually persuaded in favour of Marseille after De Cuers had lobbied and enlisted the support of Eugene de Mazenod, the Bishop of Marseille. De Mazenod had made it clear that he was keen to establish perpetual adoration in his diocese. Also, as De Cuers would have known, Eymard was likely to be amenable to any invitation from the highly respected Bishop de Mazenod. In mid-1858, De Cuers advised Eymard that de Mazenod wanted the Congregation to come to Marseille. The bishop also supported a plan (that may have originated from De Cuers) for the Congregation to take over the monastery of the Order of the Minims, who had declined in numbers and were likely to vacate their property at 7 rue Nau. On learning of de Mazenod’s willingness to accept the Congregation subject to the rights of the Minims being respected, Eymard had no hesitation in favouring the Marseille proposal ahead of others that were being considered at that time. A generous offer to open at Arras was immediately rejected. ‘Come as soon as possible’, de Mazenod wrote to De Cuers in January 1859. The withdrawal of the Minims in early 1859 allowed the plan to proceed. Little time was lost. The fully furnished rue Nau property was purchased with the assistance of a benefactor. By April 1859, De Cuers was living on the site and supervising renovations in preparation for the opening of a chapel and a community house. In mid-1859, Eymard travelled to Marseille to announce and promote the project. A large number of people were reported to have heard him introduce the Congregation’s plans on 3 June at the Church of the Holy Trinity, which was located about a kilometre away from rue Nau. More funds were raised at this meeting. Promotion of the new foundation continued over the next couple of weeks, when Eymard preached twice a day at the local masses. At the same time, back in Paris, all was not well. Two priests had left the community at Faubourg Saint-Jacques and others who had earlier expressed interest in Marseille had changed their minds. Without adequate numbers of religious, the opening of the Marseille foundation had to be postponed. To Eymard, the sense of abandonment that they experienced was a sign of being tested by God. He told De Cuers that they would have to surrender themselves to God. There was nothing to fear, he said. But it must have been difficult not to be fearful when their well-laid plans had collapsed at the last moment. In the second half of 1859, De Cuers continued with preparations at Marseille, living like a pauper and spending all available money on vestments and liturgical furnishings for the sanctuary of the new chapel. His richly decorated altar emphasised the Kingship of Christ. A series of steps led to a magnificent throne of exposition where the monstrance (for exposing the consecrated Host) was set below a royal mantle or canopy surmounted by a crown. The royal mantle style of altar setting, established by De Cuers at Marseille in 1859, would be adopted at Congregation churches throughout the world until the liturgical reforms of the 1960s. 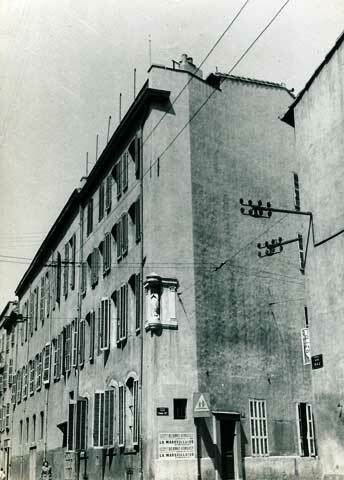 7 rue Nau, Marseille (1950s). On 9 November 1859, Bishop de Mazenod inaugurated the new religious community at rue Nau with the celebration of Mass and exposition of the Blessed Sacrament. The foundation community was small, made up of only three priests and two brothers under the leadership of De Cuers. Although numbers were not yet large enough for the community to establish perpetual adoration in its own right, by early 1860 the chapel was a vital part of a diocesan system of perpetual adoration that Bishop de Mazenod successfully established at Marseille Cathedral. Under the leadership of De Cuers, the Marseille community developed along different lines to the Paris community under Eymard. Both models glorified the Kingship of Christ in the Eucharist. The Paris community was more apostolic through its work for the poor and in the preparation of adults and children for the sacraments of the Catholic Church. The Marseille model was more narrow and inward with its emphasis on reverence, duty, beauty, and worship. When De Cuers eventually succeeded Eymard as leader of the Congregation in 1868, he was able to ensure that his own Marseille model had the greater influence on the early development of the Congregation in the immediate aftermath of Eymard’s death. The pervasiveness of the Marseille model and De Cuers on the character of the Congregation is illustrated in the history of what began at Marseille as the ‘Aggregation of the Blessed Sacrament’ (or ‘Association of the Blessed Sacrament’). The Aggregation was intended by Eymard to allow lay people to be more closely involved with key aspects of the work of the religious members of the Congregation. In the early years in Paris, when the Congregation had insufficient numbers to fulfil its mission, Eymard had sought and obtained the assistance of lay people. The Aggregation was Eymard’s way of formalising an association with lay people. He was honoured that Bishop de Mazenod inaugurated the Aggregation at Marseille on 17 November 1859 and immediately signed up to become the first member. Within a couple of years, thousands of people were enrolled and the movement was beginning to spread throughout France and overseas. Influenced by De Cuers and the Marseille model, the apostolic lay mission embodied in the first two works was soon sacrificed in favour of the third. But Eymard had not placed cloths and candles before the importance of the sacraments, and he had wanted a close and meaningful partnership with lay people in the Congregation’s work. In another place and time, his followers would be challenged to rediscover that message.